It’s hard not to feel sorry for Verdell Jones. 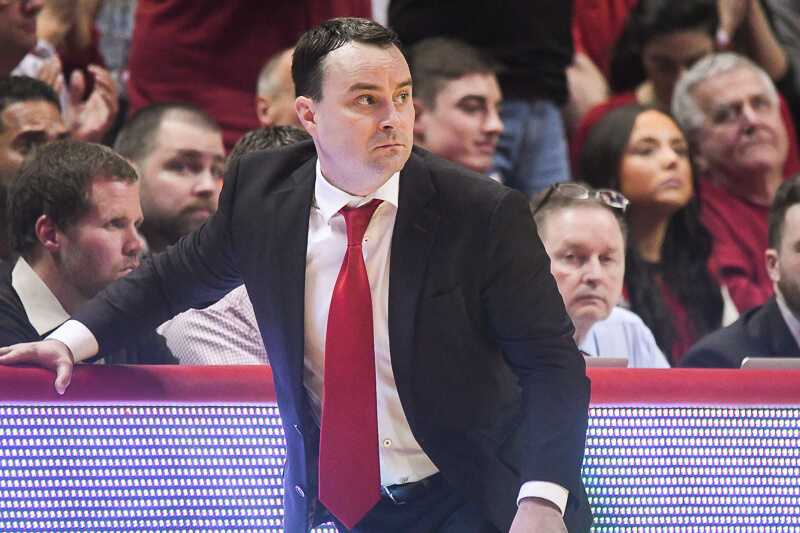 After four years of hard work and sacrifice, the senior guard won’t get to play when Indiana opens the NCAA Tournament against New Mexico State on Thursday night. 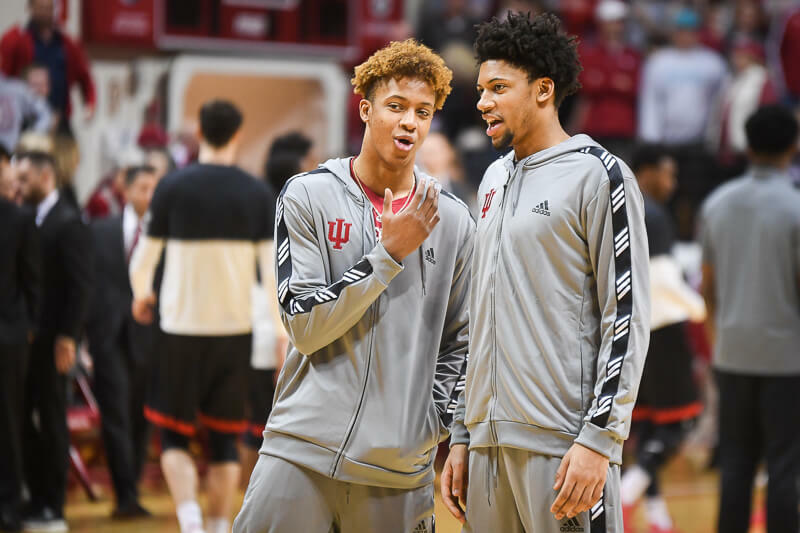 But beyond the sympathy surrounding Jones’ torn ACL, there’s a sizable void left on the Hoosiers roster. 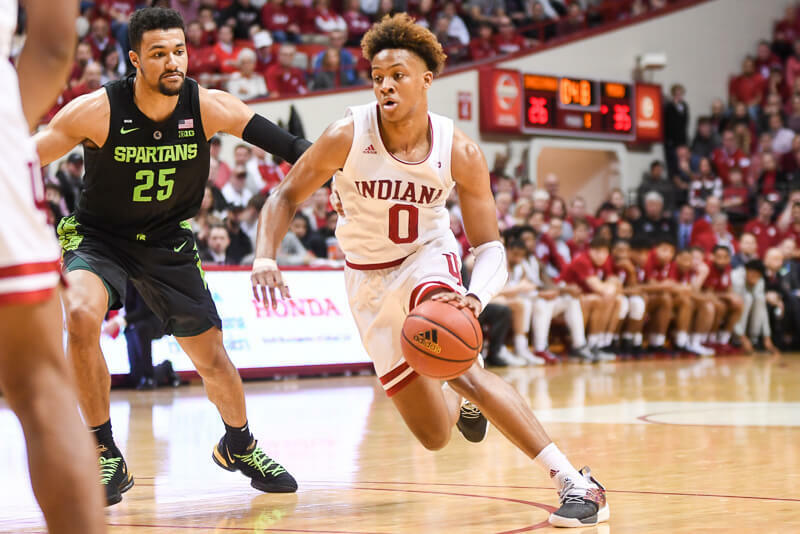 Jones not only gave the Hoosiers 7.5 points and 3.2 assists per game off the bench, but he was also one of their most experienced on-court leader. The Hoosiers don’t lack depth behind Jones, but they do lack experienced depth. Freshman Remy Abell figures to get most of Jones’ minutes in the Big Dance, and senior Daniel Moore is next in line. While Abell has played well at times this season, he’s occasionally shown freshman inconsistency. His best game came at Purdue in early February when Jones was out with a shoulder injury. In that contest, Abell scored 13 points on 5-of-6 shooting, including a dagger 3-pointer late that put the Boilermakers away. Abell hasn’t been in double figures in any other game, and he’s averaging only 2.8 points per contest. Still, the Hoosiers have faith Abell can play a role in their postseason run. While Jones won’t be able to help the Hoosiers on the court in the tournament, he can contribute by, as Crean said, helping Abell. Jones and Abell room together for road games, and Jones said he’s in the ear of his understudy as much as possible. Abell knows he can stand to be more vocal on the court. He said he was never asked to be a vocal guy at Louisville’s Eastern High School, and he’s naturally a quiet person. With a little pushing from Jones, that’s starting to change. I hope he plays really well in one more game… the one in APRIL! Man, remember when we got Remy? Seemed like such a random and maybe unnecessary pickup at the time but now it may prove crucial to our season. And of course who wouldn’t like to see Daniel Moore pop up with some Barea-type postseason impact? I agree regarding the abell pick up… however, I don’t see Danny making much of an offensive impact, seeing how he does not ever shoot the ball… drive and kick, drive and kick, drive and kick, alley oop, drive and kick…. Oh I agree that it’s unlikely. I’m just saying it’d be fun to see him come in and do his waterbug thing against an unsuspecting team. I certainly don’t expect it, but it’d be fun. Couldn’t agree more psvirsky on the Abell pick up. I think most of the fan base questioned that signing and wanted to pocket the scholarship. We thought it was big that we had Abell when Creek went down again and now that VJ3 is out, the Remy signing looks genius. It just goes to show the fan base, not matter how intelligent we think we are, CTC knows more and is doing everything he can do, looking at all options to make sure we are the best team we can be each year. I am so proud of what this team has accomplished and I know I will never forget this year. I love Danny, but he’ll go Peter Griffin before he ever goes Blake Griffin. hahaha. I see what you did there. Well played, sir! We will miss VJII. Anyone who doubts this needs to go back to the shot that really solidified our position back – VJ pass to Cwat and a win over pUKe. Remy is solid but a freshman. The NCAA games last night let us know what can happen. Both teams lost big leads and lost. The biggest difference in this years team other than CZ is that we now close out games. That comes with leadership, and that is earned over time. I think Remy will contribute more. However, what I would like to see more of is minutes for Sheehey and VO. These two have been key and with CZ and CWat inside and Hulls and Roth outside. Now if we could get Elston to do what CWatt is doing and rebound better this team would be firing on 11/12 cylinders. VJ’s contribution is more than his play on the court. Don’t need to look back to far to see how important that is. He is still integral to the success of the program and this team’s fate in the tourney. I respectfully disagree. While Jones had a rough stretch for sure, he really started to shine in the latter part of the season, coming off the bench and providing that late game leadership. Remy playing all those minutes this year may have helped Remy more, but I feel Jones playing has helped the Team more. like everybody else, i really wish we had vj3, and not just from an emotional standpoint. he was playing his best ball of the season when he got hurt. i do, however, feel that remy stepping in does have a silver lining. the dude can play some d, grab some boards, and get to the rim (not that he’ll be needed so much as a scorer). equally important, he’ll bring toughness and energy in spite of his quiet nature. remy, it’s your time to shine, baby! make the most of it! Never ever for any circumstances do you save scholarships for future years. Only silly fans would think that way. Luckily Crean knew better. You never know what can happen from year to year with injuries and departures. You can never have too many backups if they are capable and Remy is capable. Remy will need to step up big and I believe he will be pretty solid but if Vic doesn’t get over his shooting funk we are done. As I have mentioned too many times since last week 3-20 shooting over two games really needs to be corrected. Vic needs to continue to be aggressive but not force things that aren’t there. I believe over those two games he shot more times than anyone else on the team. Hard to win when your main threat is shoting 15%. With all due respect to VJlll, and the absense that his lack of leadership will have, I actually feel that we are potenitally better with Abel in the tourney. The beautiful thing about freshman in the tourney is that they have less pressure on them and at times can let all that pressure that Verdell would be experiencing in big moments fall aside and just play. I think Abel is quicker, has a better jump shot, better defender overall, much stronger physically, and has earned the fan base’s confidence in him with his play in the reduced role that he has performed up to Verdell’s latest injury. With that being said, going into the Big Ten tourney, I was not considering our prospects of doing well in that tourney or the NCAA tourney as being all that dependent upon VJlll contributions when healthy. But when someone does go down that you have that does have a specific role for in a back to back tournament, it will have an affect. But we really need to be honest, VJlll being out did not get us beat by Wisconsin. That was based primarily because one player played the game of his life, and the rest of the team also for the most part did what they usually do. It makes me laugh when the so called experts try to put so much into the absense of VJlll for this team going forward because he has not truly been one of the most important factors on this team the whole season. Sure it is very respectful for everyone to say it, and he has earned all the gratitude and recognition that he is getting, but on the floor, he is replacable and with as much respect as possible in saying it, it will not be a factor going forward with the exception of using him as an excuse for not performing and living up to the expectations that come along with everything this team has accomplished. I strongly feel that this team would be in the exact same position if he was not on it. The only player that we really have suffered from not having is Creek. If he was healthy this year, we would have likely been in the situation of competing for the Big Ten regular and tourney titles, as well as a potential 2 seed in the NCAA tourney. I also respectfully disagree with you. I feel that Verdell has had a much bigger impact coming into this season than he has had on the floor this year. All in all, his impact has been far greater in the sense of what he has meant to the program moving forward than what it has meant to this years team. Well, I just shelled out 2 bills for a seat fairly close to the court. I sure as heck hope we play well. I think the two most important things for us are going to be: 1) The first 5 minutes and overcoming any nerves; and 2) Stepping on their throats when we get up on them so we don’t have a repeat of last night’s games. Go Hoosiers! VJIII was playing his best basketball as a Hoosier after his shoulder injury. He wasn’t trying to force the action, and his mid-range game really helped us. He could create his own shot, and defended the perimeter well. As stated many times, his leadership on the court will be missed. That being said, he has been a role player and IU played well in his absence earlier in the year. Remy is very athletic and has played well against teams similar to NMSU. If we win the first game, which I expect us to do, VJIII could be missed against a team like WSU. B1G Tourney, travel to the west coast along with the task of trying to beat UK again this season on a neutral court tomorrow night without one of their key seniors. Go IU! Victory for V! I agree a healthy Mo Creek on this team would have been huge. He is a great talent and I hope he is able to come back next year and have one great year. I have been pro Remy all year because he is another good athlete we desperately need especially on D.
anyone know where i can find video of the 2001 IU vs Duke game? 2. JH has carried this team on his back more than once this season, goodness, did you forget the Penn State game in the B10 tourney? Finally, where will this team find a “spark”? That’s easy. Tom Crean is THE spark of this team and he’s not going anywhere. The guy defines “spark” with what seems to be limitless energy. I forgot how close we got to blowing that. Completely agree Millzy. VO needs to hit a higher rate than 15%. When he attacks the basket he is going to have to convert and until he is consistently knocking in his dunks/layups, I don’t want to see any jumpers from him. One small point…VO didn’t shoot more than anyone on the team over the past two games. Hulls shot 20 times (equals VO) and Watford shot 21 times. I only bring this up because before the Big Ten Tournament, there was a lot of discussion about the struggles of Hulls and Watford and their disappearing act. They both turned it around the past two games, hopefully VO can do the same. I think Remy will be willing and able. This is a great opportunity for Remy and the rest of the team . How awesome this tourney experience will be to lead next years class . Remy went to my alma mater here in Louisville so I have watched him for awhile . I believe Remy will be fine he dosent seem to get rattled under pressure , plays solid defense , gets to the line , and can make the pass . Wanted to thank you for posting this link! It is awesome, there are a lot of games that an insomniac like myself can watch at night instead of getting the sleep that I wish I could be getting. At least now I will not be bored and pissed off about it! Thank you so much! Wow my man you are way off. It’s late in the season, and I’m just too tired of the ridiculousness to fight this fight any more. But thanks to those of you who are. Verdell deserves it. I strongly disagree with you. And the idea that this team would be a 4 seed without his contributions his ridiculous. I only lasted about an hour. So disappointed in myself. I’m sorry but I don’t think you understand that importance of having a leader on the floor who you can depend on to bring a team together during tough times. I am not saying through actions, but through words. If a team doesn’t have a floor general they fall apart. And let me tell you, most (yes, I agree not all of them are) experts know what they are talking about, hence the reason they hold that job. Another thing you said that didn’t make sense to me was “The beautiful thing about freshman in the tourney is that they have less pressure on them”. Do you not realize that the reason many highly skilled teams don’t advance it is because they have freshman at key positions that don’t know how to deal with the pressure of the NCAA tournament? It is the ultimate pressure moment, and believe me, the freshman will be feeling it more than a Watford or Hulls will. Finally, I don’t know if you can say losing Creek cost us a 2 seed. I really am not sure Mo would be better than Sheehey or Oladipo, and having him back would have caused a major log jam for minutes at any of the guard spots. If anything, I feel as it allows our guards to play more loose because they don’t have to constantly look over their shoulders after ever turnover or missed jumper. I may not be the biggest expert, but just throwing my two cents into the ring. Hope we pick up a victory tomorrow night. Go Hoosier! I love how everyone assumes that VJlll is the only person that has leadership responsibilities on this team. Hulls, Watford, Oladipo, and Sheehey are also leaders on the floor. Not to mention the leader on the edge of the court in CTC! Remy will have a role to play on this team moving forward. Do you also know how often freshman that no one on the national stage has come up big in the key points during tournament play as well. No matter what it is a roll of the dice, but so would be rolling the dice on a Senior who has a 4 year history of being turnover prone. Lastly, you must forget that before Creek got injured as a freshman he was avg 16 ppg. If you actually think he wasn’t trying to play too soon last year before he got hurt again, then nothing I say will help you realize that these are just truths. I value VJlll, but I am not going to pretend that he is the heart and soul of this team, and I will not be every uttering the words: “if Verdell Jones lll was healthy during the tournament we would have gotten further.” It does not have the same affect that losing Alan Henderson had when he got injured prior to the tourney.